Being able to drive in different weather conditions is an essential skill for any good learner driver. Weather conditions, especially heavy rain and bright sun, will often take even the most experienced drivers by surprise. Below we have put together an essential guide to driving in different weather conditions to help students just like you. 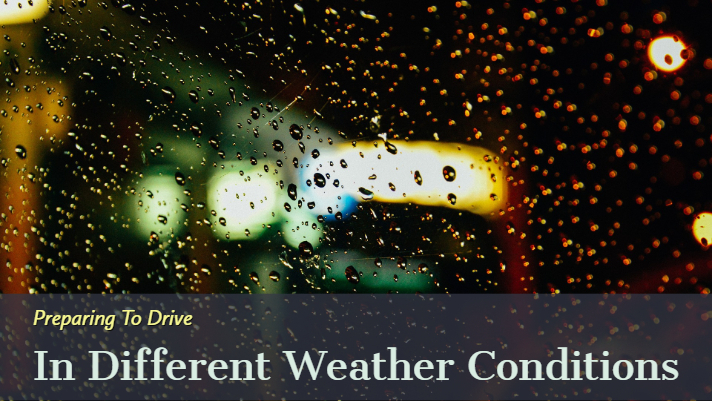 When we talk about bad weather, we typically think of snow and rain; however, there are a lot of other weather conditions that can cause difficulty when driving. In fact, fog is probably one of the most dangerous and difficult conditions to drive in and requires a lot of care and attention. Firstly, you should take some time to prepare your vehicle for the journey. In foggy conditions this should include ensuring that your windows are de-misted and that you are familiar with the different headlights in your vehicle. During fog, the most appropriate headlights to use are your fog lights (often referred to as low beam) rather than your full beam; this is because your full beam can actually reflect back against the fog and cause a glare. When visibility drops to below 100m, The Highway Code states you must use your headlights. As with all adverse weather conditions you should slow down and increase the stopping distance between yourself and the car in front of you. Special tip: Watch out for patches of fog. When fog is patchy it can often appear as if the fog has cleared and you can see again, only to reappear again and take you by surprise. You can combat this by maintaining a reduced speed until you are sure the fog has cleared. Roads covered with ice and snow can be very hazardous. When driving in these conditions, you should exercise caution and maintain a low speed at all times. When preparing your vehicle, ensure that your windows are de-misted, you have your low beam lights turned on and that you have switched on your window wipers to the appropriate setting. It is also important to ensure that your wiper fluid is topped up, as snowfall can leave marks on your windscreen which can cause problems with visibility. Melting snow can act as a lubricant on the road and icy surfaces will make your vehicle difficult to manoeuvre. When braking, it is essential to use them gradually and slowly. It can feel like an instinct to brake harshly in order to keep control of your vehicle, but this will actually cause you to further loose control and skid. When turning, you should follow the same procedure – moving gradually and slowly at all times. The key to remaining safe during snow and ice is to remain calm and steady! By following simple measures such as reducing your speed and leaving more distance between other vehicles, driving in the rain will quickly become second nature to new drivers. As with all adverse weather conditions, ensure that you once again take the time to prepare your vehicle. When driving in rain, this will usually include ensuring that your car windows are de-misted and that your wipers are set to the appropriate speed. The most important thing to remember when driving in the rain is that your stopping time will increase on wet ground. You should leave at least four seconds between your vehicle and the vehicle in front of you. If the rain is distorting your view, you may need to turn on your dipped headlights. If you have severely reduced visibility you should find a safe place to pull over and wait for the rainfall to slow or reduce. As we usually welcome bright sunshine with open arms, we often overlook how this can impact driving conditions. However, just like extremely cold conditions, extreme amounts of sunshine can also be something a driver needs to prepare for. It is very important that your windows are clean during sunshine; the glare from the sun can reflect from dirt on your window and make it extremely difficult to see. When driving, wear dark sunglasses and use your sun visor in order to reduce the glare as much as possible. Also remember that vehicles left in the sun can become particularly hot to touch, so exercise caution when touching your steering wheel or seat belt. Preparing to drive in different weather conditions can be made a lot easier by taking the appropriate precautions. The most important think to remember is to take the time to prepare your vehicle and reduce your speed.